Voynichese: a forgotten turkic-aramaic-persian language? Hello all! I'd started my research in Voynichese 2 years ago and have got some results! I've found the five basic elements on the upper of f77r page - there was 5 images of them, blowing out of their fittings and inscription of each. Then I've started to finding and comparing words with the same meaning and sounding in the languages of all over the world. 5. *H*ox8aiiU - [ TOŞƢӘÑD / ТОШҒӘҢД ] - Probably, from a city named Tashkent (Uzbek's capital). This word in Uzbek means 'a stone city' and sounds like Toshkänt. 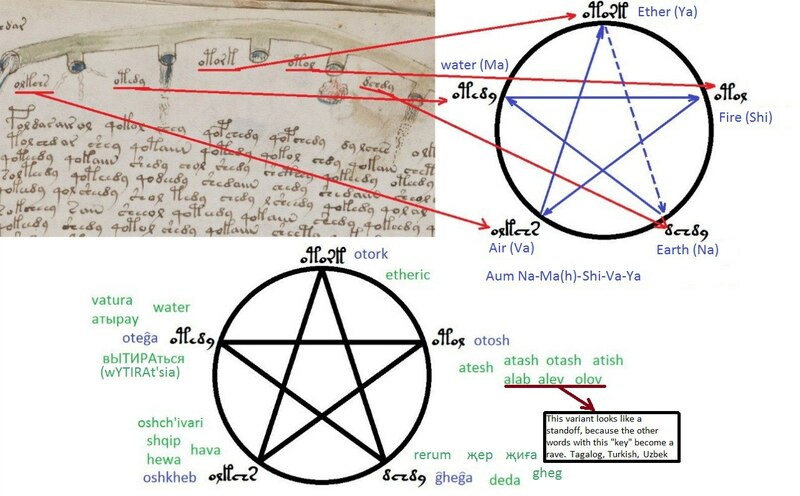 RE: Voynichese: a forgotten turkic-aramaic-persian language? Very interesting. I will study your proposal further. For the five elements, air, earth, fire, water, and ether, I notice that your illustration gives a range of options for each. Is it possible to provide a list of identifications that you've chosen, and the language that they come from. Also any other words that you feel you have positively identified. Have you tried to read any two word phrases? Or more than two words in a row? 8гс89 - [ ĞIƢA / ҖИҒА ] - giving a life (from Turkic grammar), world, Earth; Turkic - Jir, Jer (world); Caucasian - gheg, deda (mother), geg; Albanian - gheg; Russian - zhizn' (life), zhivoy/zhivaya ; Chinese - tsi, Indian - shi(va). o*H*o2H* - [ OTORK / ОТОРК ] - Ether, etheric; 'utur' in Turkic (Chagatai-Uyghur) means 'fulminant' representing a speed and an electricity both. rcox - [ JIOŞ / ХӨШ ] - poison; Arabic - hash; Armenian, Turkic - xashxash. P*arc - [ PӘJI / ПӘХИ ] - five; Urdu - pach; Russian - piat'; Indian - panca: pandz, pendz, pindz, penta (Greek! ), pinta (English?) in other IE. 9S - [ AB / АБ ] - river; Caucasian, Indo-Iranian - Av, ov, ob, ab - water, river. 9*H*aiiU - [ ATӘÑD / АТӘҢД ] - understanding, notion? ; Portugese - Entendo. o*H*ox o*H*9 *H*ox89 - [ OTOŞ OTA TOŞƢA ] - the fire is a father of a stone. (f9v) 4th row. A Turkic ending ƢA means dative. I think you need to get a handle on where your vocabulary is coming from. While a Turkic language with borrowings from Persian and Arabic might be reasonable, the sheer range of sources you quote is too vast. Some of these sources are also impossible for the manuscript. For example, you quote the Russian word 'boycott', but that comes from the English surname Boycott and dates no earlier than 1880. (21-09-2016, 10:14 PM)Emma May Smith Wrote: You are not allowed to view links. Register or Login to view. I think you need to get a handle on where your vocabulary is coming from. While a Turkic language with borrowings from Persian and Arabic might be reasonable, the sheer range of sources you quote is too vast. In Mingrelian dialect of Georgian is the prefix 'va' that means negate, antithesis. And the same we, maybe, have in Voynichese with '4o' corellating with Deutsch sounding ( vo - [fo] ). There is a word "rco" - [ JIO / ХӨ ] in the VM. This word is found in Chechen only (хьо / hio). Meaning - "you". (21-09-2016, 10:27 PM)escape Wrote: You are not allowed to view links. Register or Login to view. It's English, from a placename in England. None of the three examples you give: wo/man, fe/male, and wa/ter(ra), have the etymological origin you're assigning to them. Indeed, neither male and female, nor water and terra, are related at all. (21-09-2016, 10:58 PM)Emma May Smith Wrote: You are not allowed to view links. Register or Login to view. I know, but what if it isn't that? We must to accept all possible assumptions to crack Voynichese till the end. This is the main principles of the fuzzy logic analisys that I have applied to VM. We just haven't another way to do it. Trying to translate words, correcting transcription and again, and again, almost as shown in Derek Vogt's videos. It's going to take me a while to read all of this thread and I can't do it until after I've finished work, but I wanted to mention that I've come back to Turkic languages a few times. Some languages are a better match to word-length, word-order, and consonant-syllable balance and structure than others and Asian and Turkic are a couple of the language groups on my list that seem to work better than others. (21-09-2016, 11:47 PM)-JKP- Wrote: You are not allowed to view links. Register or Login to view. It's going to take me a while to read all of this thread and I can't do it until after I've finished work, but I wanted to mention that I've come back to Turkic languages a few times. I think a Turkic language is perfectly possible, and indeed a good compromise between structure and availability: it's exotic enough compared to Indo-European, but not too exotic to be unknown in Central Europe. By the 1400s the Golden Horde had introduced numerous populations of Turkic speakers far into Europe. We have indications, such as the Codex Cumanicus, that Turkic linguistics was of interest to at least a few scholars, providing the possibility for a European-produced but Turkic-language book.